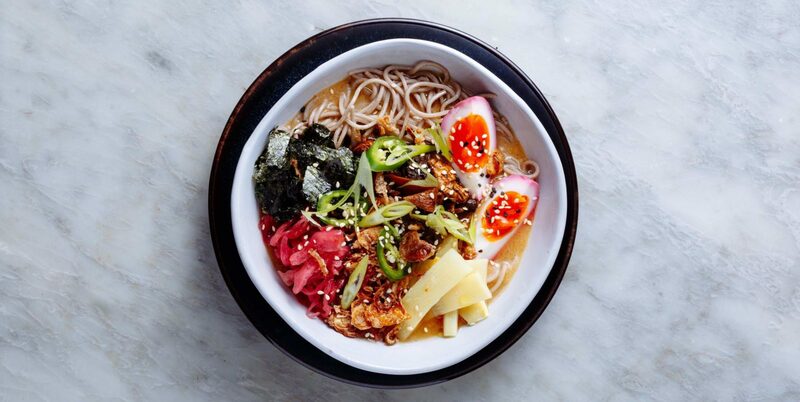 This Soba noodle recipe is the perfect mid-week supper for cold winter nights when you want to eat something filling and satisfying. It packs a punch on the flavour too! 1. To beetroot die the eggs, cook the eggs so that they’re only soft boiled and once cool, peel and leave to soak, covered in the beetroot juice for an hour. 2. Pour the dashi or vegetable stock into a large pan. Bring to the boil over a medium-high heat. 3. Add the dried shiitake to the stock with a pinch of salt. Lower the heat and let the stock simmer until you are ready to assemble. 4. Transfer 200ml of dashi or stock, without any mushrooms, to a small saucepan. Bring to the boil then reduce to a simmer. Add the other sauce ingredients then blend in a food processor until smooth. Let it simmer over a low heat until ready to serve. 5. Meanwhile prepare the add-ins and toppings and cook the noodles according to the packet instructions. 7. Fry off the fresh shitake mushrooms in a little oil on a high heat and season. 8. To assemble – pour the remaining litre of hot dashi or vegetable stock into serving bowls. Stir the tare into the stock. Divide the drained noodles, add-ins and toppings between the bowls. Customise your heat and strength of flavour to taste.